What does the rigorous graphic design approach of the 1950’s have to teach today’s information architects? A question at the heart of the Swiss Style Reboot exhibition, which starts on June 1st in Boston. What is Swiss Style and why is it useful for today’s information designers? The Swiss Style Reboot exhibition, beginning on June 1st in Boston, presents the graphic design principles developed by the pioneers of Swiss Style, which is characterized by clear, functional and highly crafted visual communication. It explores their particular relevance for today’s infographics, data visualizations and interactive interfaces. The first part of the exhibition showcases masterpieces by mid-20th century pioneers of Swiss Style, including Josef Müller-Brockmann, Max Bill and Karl Gerstner. The second part of the exhibition measures the significance of Swiss Style within today’s information-design community. It presents video interviews with well-known information architects from the U.S. and elsewhere, focusing on if and how they apply this style’s principles in everyday practice. 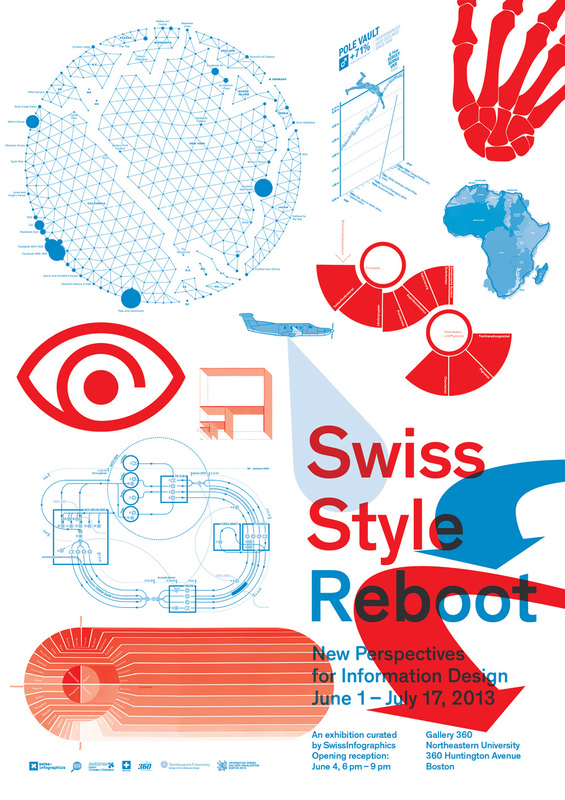 The third part showcases new research by international designers who are currently extending the Swiss legacy into infographics, data visualization and interaction design. The historical part of the exhibition presents works by, among others, Otto Baumgartner, Max Bill, Karl Gerstner, Armin Hofmann, Ernst Keller, Peter Megert, Josef Müller-Brockmann, Siegfried Odermatt, Emil Ruder, Jan Tschichold, Massimo Vignelli, Carlo Vivarelli, Jean Widmer and Kurt Wirth. The contemporary part of the exhibition features works by, among others, C2F, Catalogue Tree, Nicholas Felton, Francesco Franchi, Alessandro Giberti, John Grimwade, Nigel Holmes, Kai Krause, Martin Krzywinsky, LargeNetwork, National Geographic, onlab and Superinteressante. 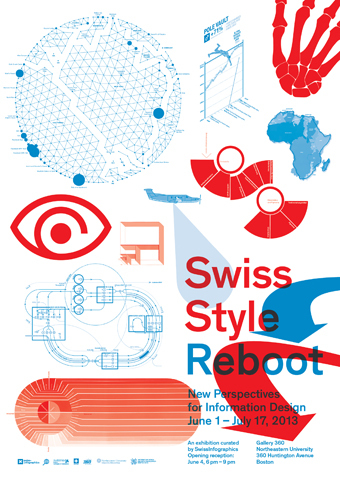 Swiss Style Reboot is being organized by SwissInfographics in collaboration with swissnex Boston, Presence Switzerland and the College of Arts, Media and Design at Northeastern University.